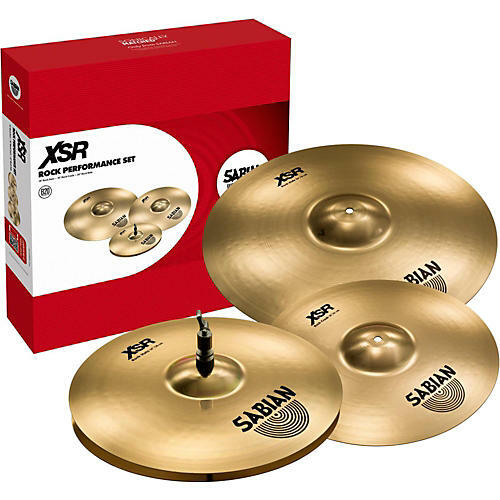 Powerful, rock-weight models are featured in the Sabian XSR Rock Performance Set, including 14" XSR Rock Hats, 16" XSR Rock Crash, and a 20" XSR Rock Ride. XSR is not a budget series, but rather a line of smartly-priced cymbals that would not be out of place on any drum kit, on any stage. Powerful, rock-weight models are featured in the Sabian XSR Rock Performance Set, including 14" XSR Rock Hats, 16" XSR Rock Crash, and a 20" XSR Rock Ride. XSR is not a budget series, but rather a line of smartly-priced cymbals that would not be out of place on any drum kit, on any stage.